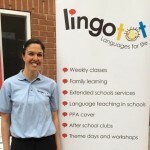 Southampton Lingotot Centre | French and Spanish classes for kids. MFL PPA cover. I'm Melissa, mum of 3 little beauties, Theo, Laila and Amelie. I have always been passionate about languages as I was brought up to be bilingual by my French mum. I decided to become an assistant at a school in France as part of my French degree and then went on to train as a French teacher at secondary school. I love teaching children and truly believe that learning a language from a young age is so important. Children are like sponges, the younger they learn a language, the more it will become second nature to them and a life-long skill! Lingotot classes are packed full of interactive songs, games, stories, a craft and most importantly are fun! All of the sessions are conducted almost entirely in the target language and you learn with your children. Classes are suitable for babies, toddlers, young children and their parents/carers so that the whole family can enjoy learning a new language together. We offer plenty of support for mums, dads and grandparents, so you can continue your family's language learning journey at home. I teach in community classes, nurseries, KS2 at Primary Schools (PPA) and afterschool clubs. Please get in touch if you have any questions or to register your interest.